Wixie includes a host of built-in training materials, including tutorials designed to help students (and teachers) learn to use Wixie independently. When teachers log in, they can see these resources at the Training tab. Students can access them from the Help option that appears when they click the Wixie button. The Wixie training resources include Recipes, tutorials that provide step-by-step directions for a project. There are three different tutorials, depending on the level set for the training resources. Users can choose their level based on both reading level and computer experience. If the content of the tutorial matches what you teach in the classroom, download the PDF and make the project with your students. You could also assign it as a task to be done in-class, as homework, or ask a small cadre of students to complete the tutorials so that they can serve as your Wixie power users and support team. Don't worry if the content of the tutorial doesn't match your curriculum. Use it to give students a quick set of basic skills, or use the steps in it to build a similar project that does match your curriculum. Here are some ideas for each tutorial to get you started. In the level 1 tutorial, you use the paint tools to create a picture of yourself and label it. Then you add another page and use stickers to "write" your name and match pictures to it. You print the two pages as a table tent. For primary age students, you probably don't need to move beyond the paint and label skills from page 1. If you prefer to start from a blank page, have students use a Wixie page like a sentence strip. Type a sentence and then use the paint tools to create a matching picture. You might want to add a prompt such as "I like" or "I go" to the page. You can also consider creating your own version of a favorite story, like It Looked Like Spilt Milk by Charles G. Shaw. You can even assign the page to your students from the Wixie Activity library and then combine it together into a class book. While students are becoming more capable as they get older, you don't need to make the technical part of a project more complex. Each of these ideas, with corresponding lesson plans on Creative Educator, can be done using two pages. Animal Riddles - add text to share your riddle on page 1 and show a visual of the answer on page 2. Print and display as a table tent or card challenge. Visualize Word Problems - have students use text, paint, and stickers to write and illustrate a word problem. Duplicate the page and solve the word problem showing the equation on the second page. A New President for Rushmore - after studying US presidents, have students choose which one should be the next to be honored on Mt. Rushmore. Have them add their president to the monument on one page and add text to make their argument on the other. A simple two-page project can provide a fun option for both formative and summative assessment. Design a Book Cover - after reading a novel or short story, ask students to design a new book jacket for it. Before they begin working, they can rotate the page to have a portrait orientation and then create a visual representation of the content and theme of the book on page 1 (front side), and share a summary of the plot (without giving away the ending) as well as a review of the book on page 2 (back side). Design a New Dollar Coin - coins often commemorate an important individual or event. Have students choose a person they admire from their class, school, community, history, or science and create a new dollar coin to honor that person. page 1 should include an illustration of the front and back of the coin and page 2 should contain both text that argues why this person should receive the award. In the level 2 tutorial, you create multiple pages to retell Where the Wild Things Are by Maurice Sendak, learning to use the tools, as well as learn how to record narration. The level 3 tutorial covers similar features, but with a focus on information about severe weather safety. If students can complete the steps in these tutorials, they are pretty much ready to apply Wixie to inform, present, persuade, and share in a range of curriculum areas. 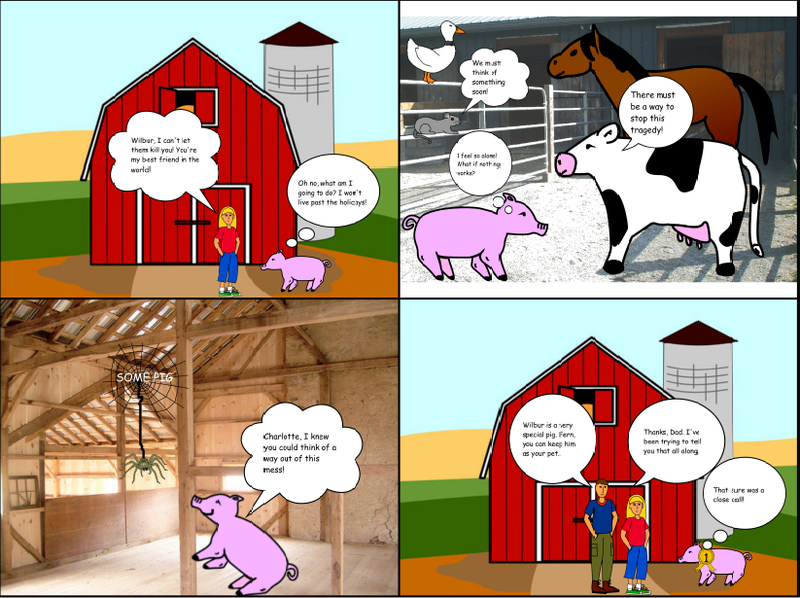 If you want to keep with the theme of retelling, have students create a comic to summarize a story. The limited amount of space in a comic’s panels supports this process by forcing students to choose a small amount of text to share the most "significant points in a text or story." After creating full-size pages for each panel, students can use Wixie's print features to create a single sheet with four or six images. Comics are also a great way for students to showcase understanding about scientific cycles such as butterfly metamorphosis, the rock cycle, or the nitrogen cycle. Interviewing an animal is also a fun way to share and showcase knowledge. It also incorporates the recording feature that gets missed when printing comics. If you want to continue connecting to literature, have students modernize a fairy tale or create a character scrapbook. Students want to do real work and Wixie's makes it easy to present and share their work with a wide audience. Tap into middle school students energy and idealism by asking them to apply argument and persuasive techniques to inform the public and change minds! Creative Educator has lesson plans that provide ideas for crafting argument presentations for an upcoming Class Trip as well as PSAs with a conservation focus.